Why do Business in Cerritos? “Rarin' to Ride” and “Baby Greens” are located just outside of Wood Ranch BBQ & Grill's main entrance in the Cerritos Towne Center. The sculptures were created by a husband and wife team. 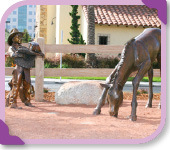 “Rarin’ to Ride,” a life-sized sculpture of a young boy, was created by George Lundeen, who also sculpted the “Joy of Music” at the CCPA and the dolphin fountain in the Civic Center. 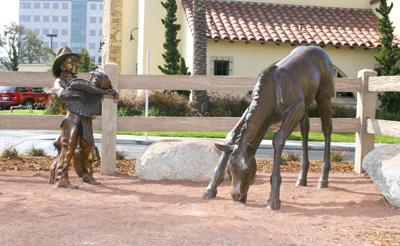 The depiction of a horse, “Baby Greens,” was sculpted by Cammie Lundeen. The bronze pieces were selected to complement the western theme of the restaurant, and are placed in a simulated wooden corral with pavers and natural landscaping. Artist statement: “Baby Greens” is a portrait of one of my foals I raised. I love how comical foals are when they try to graze with their long legs and short necks. The new grass must be worth the effort. Size: 43" x 58" x 26"
Artist statement: “There's nothing as good for the inside of a man as the outside of a horse.” Will Rogers knew his way around a horse the same way kids now know their way around a Chevy. This piece, “Rarin' to Ride,” is my idea of the great relationship between man and his four-legged friend.